Attention: Final Stock ! Very limited supply ! 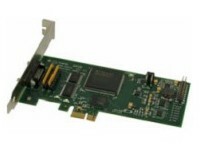 PCIe is the next evolution of PCI. It offers fast data transmission for demanding test applications. Supported on both Red Hat Enterprise Linux and Windows, TAMS PCIe cards are also backward compatible with PCI software, so you don't need to re-configure any code.